Late in the second millennium B.C., as the Hittites were experimenting with bronze, they built a holy city called Nerik near the Black Sea, according to evidence being slowly gathered by archeologists. Today, excavators at the Oymaağaç mound in the Black Sea city of Samsun's Vezirköprü district are reveling in their potential find, believing the evidence is mounting and Oymaağaç will be unveiled as the holder of Nerik. 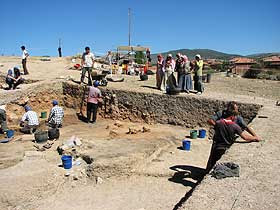 According to Zimmermann, the most prominent findings to date at the Oymaağaç dig, which started two years ago and was expected to finish in 10 years, were the fragments of cuneiform tablets. He said they were the northernmost written sources found in Hittite Anatolia. Also, he said they had found a number of bullae, which are lumps of clay molded around a cord and stamped with a seal to prevent tampering with the contents of a container, from the Hittite imperial period in the late second millennium.